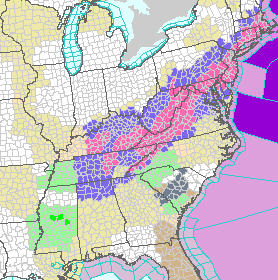 Pink = winter storm warning for heavy snow. Blue = winter weather advisory. The winter storm in the East is pretty much on track. 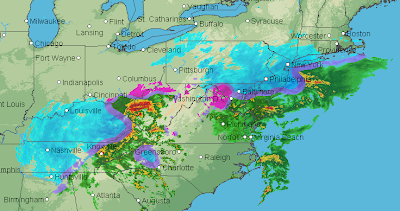 The radar shows snow (blue colors, darker = heavier) increasing in area and intensity. Finally, LaGuardia Airport is reporting average delays of 61 minutes and Philadelphia is reporting delays of nearly three hours already! These will likely get worse through the day. The Airline Crisis Survival Guide is here.